Overall this is another stunning effort from one of our favourite Kontakt library developers. Some loops sound a little generic. Heavocity's new drum machine works over 3600 samples into over 1500 Kontakt/Player instruments and 300 Multis. It has four modes of operation: Kit Grooves, Multi Grooves, Kits and Loops. Kit Grooves are the main event, centring on five drum slots (Kick, Snare, Hats, Perc and Cym/ FX), each with its own lane in an easy-to-use step sequencer. For each of the five sound types you get a bank of 12 samples, and a series of sliders let you choose which sample from each bank should be triggered with each step of each drum - clever stuff! Simultaneously, the Amp Sequencer enables step-based volume modulation and gating to be applied. Up to eight sequences can be chained, and patterns can be mixed using the built-in browser. The Kits are conventionally mapped kits and banks, enabling straightforward triggering from your MIDI keyboard or pads. "As with Heavyocity's previous Kontakt libraries, the effects really bring DM-307 to life"
Loops is the biggest category, making up over 1200 of the 1500+ instruments. The Loop Menus give you a range of loops mapped across the keyboard, while the Single Loops are sliced and mapped REX-style, with MIDI file export to a DAW. Both kinds of loops can be triggered and controlled by the various "Mutate" step sequencers that accompany them. In terms of processing, every loop and sample gets its own ADSR amp envelope, Tune, Pan and Level controls, while every bank (or sample/loop in Kit/Loop mode) has access to a filter (with envelope and LFO modulation) and four-band EQ. As with Heavyocity's previous Kontakt libraries, the effects really bring DM-307 to life. Delay, Reverb, Distortion and Modulation processors are on hand for processing the master output, along with the LFO-driven Twist tone shaper and Punish, which combines compression and saturation. But the awesome Trigger FX are where the real action's at: five step-sequenced effects designed to bring movement and dynamics to all four modes. 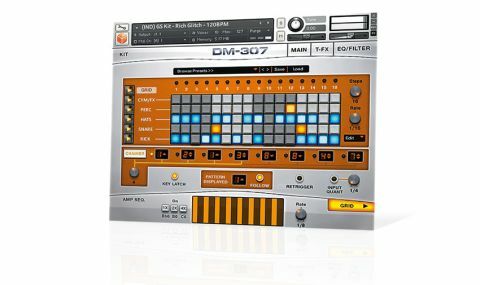 DM-307 takes in a broad spectrum of styles and instrumentation. The usual dubstep, DnB and 'electronic' suspects are there, but so are rock (albeit in a very mechanical sense), Latin, cinematic and more. The samples and loops are generally excellent, even if some of them do sound a bit generic, and overall this is another stunning effort from one of our favourite Kontakt library developers.